Preschool teachers are an especially creative and lively bunch, which made my experience with them in workshops in August particularly rewarding. Preschool is a vitally important step toward progress in literacy in Belize, especially because most children begin primary school unable to speak English. Many have learned Spanish, Garifuna, Qe’qchi or Kriol at the parents’ knee, but the official language of instruction in Belizean schools is Standard English. So if students have the benefit of beginning preschool at age three, they will be exposed to the language which they are expected to learn to read and write. However, there are only 32 preschools in the Stann Creek District, and not all of them are free of charge. In the entire country of Belize only 43.7% of children attend preschools. I was privileged to be asked to help out with the preschool teachers’ workshops, even though my primary project focuses on elementary schools. We are encouraged, however, to develop secondary projects. My favorite workshop with the preschool teachers was a practical one: reading aloud to children, something near and dear to my heart. After modeling for them, and providing tips, each teacher demonstrated for us. They were such hams! Every afternoon during the week of workshops, the teachers participated in make-it-take-it workshops and inspired each other to develop their own charts, games and visuals for use in their classrooms with shoestring-budget materials. Teachers in Belize are not given money for use in their classrooms, so they are extremely resourceful at using whatever they have available to them to make their own charts, books, games and learning centers. The following week I had the opportunity to work with the public librarian in developing a “camp” for children to attend. The theme was “seeds, plants and healthy eating habits”. Each child planted radish seeds in little plastic cups and in the two weeks of the camp, they saw shoots come up through the soil. I played my guitar, taught songs and games, told stories and read aloud to 20 enthusiastic youngsters. Two of my Peace Corps Volunteer friends helped on a couple of days. Kirstin and Cathy are both volunteers in the health sector, so they conducted two creative activities on healthy eating habits that the kids enjoyed very much. We took a field trip to the local open-air market and the children were given money to purchase fruits and vegetables. On one special weekend in August, a couple of new friends, Holger and Kerstin, arranged for us to stay at Ian Anderson's Caves Branch Jungle Adventure Lodge. Holger is a volunteer consultant with the Belize tourism industry, and his wife, Kerstin, is volunteering with the Red Cross. They invited my friend Linda and me to attempt three adventures, and I am astounded that I actually had the courage to attempt all three. And surprised and thankful that I actually survived! The first was called “The Black Hole Drop,” a 300-ft. repelling adventure into a sinkhole in the middle of the jungle. Our guides reassured us of their experience and emphasized their record of safety, so we timidly leaned back and repelled off the precipice down into the cavern, where the other guides had gone before us and prepared a delicious lunch. Our next day’s adventure was a seven-kilometer river trip in and out of caves, while floating on inner tubes. We paddled down the river using our arms as oars, so it was quite a workout, but the water was cool and refreshing and the caves so impressive, that we didn’t even notice the burn in our muscles. At the end of the 3-hour journey, a huge buffet lunch awaited us. 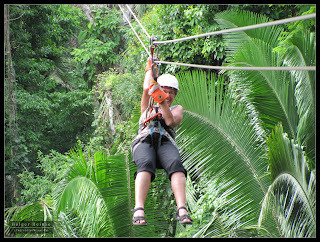 Following our repast, we were hurled through the rainforest on ziplines. 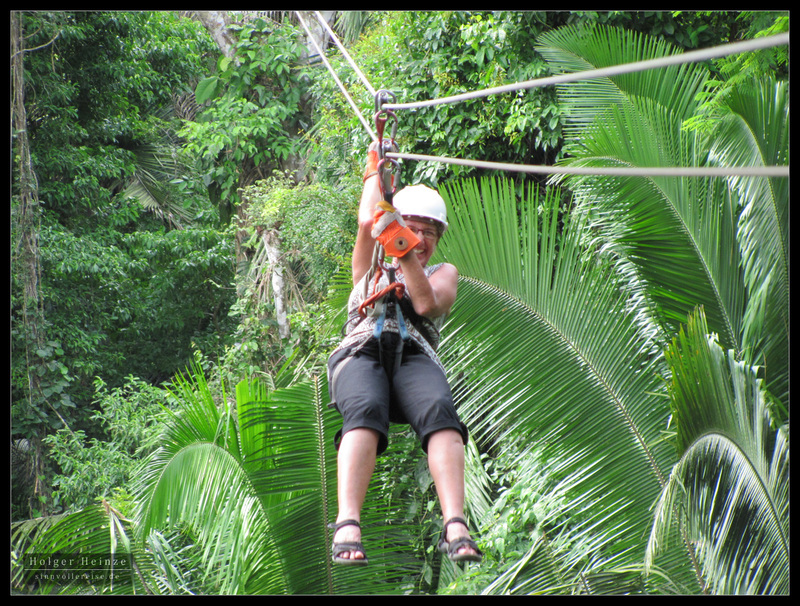 The zipline adventure was a hoot and not at all scary; just a whole lot of fun. I feel so thankful to have these opportunities on weekends. I am the luckiest Peace Corps Volunteer ever! Ava, I love the detail in your blog. Reading about what you do and with whom really creates a picture in my mind about what the experience might be like. Your passion and energy for teaching shines through. I'm enjoying your journey of discovery. Keep the posts coming. I especially liked the photo of the kids in the market.